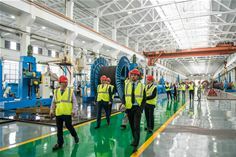 Milan, 18 October 2017 – Prysmian Group, world leader in the energy and telecom cable systems industry, announces that its Chinese factory Prysmian Technology Jiangsu Co. Ltd. has successfully started operations after completing the acquisition of some assets from the former Shen Huan Cable Technologies. Prysmian Technology Jiangsu Co. Ltd. is fully owned and managed by Prysmian Group, which provides the new factory with its technologies, assets, competences and expertise, in addition to the most experienced and trained Prysmian employees in the high voltage business, with the aim of enhancing its competitiveness in the Chinese utilities market. Prysmian Technology Jiangsu can count on manufacturing and logistics facilities consisting of an area of more than 190,000 sq m and five production lines (two VCV lines up to 500 kV, one CCV line up to 220 kV and two CCV lines for MV cables) with a production capacity of over 30,000 tonnes per year, and is thus one of the plants with highest high voltage production capacity within Prysmian Group. Prysmian Technology Jiangsu can offer a wide range of cable technologies and products designed and manufactured in accordance with Prysmian Group standards and expertise, including extra high voltage and high voltage cable systems, as well as MV from six kV to 500 kV and fire protection cables. Thanks to its technical expertise, quality and ability to deliver customised, high-performance solutions and as a further proof of its market leadership, Prysmian has recently delivered many high voltage projects in the Chinese and ASEAN Markets helping to strengthen domestic power systems.